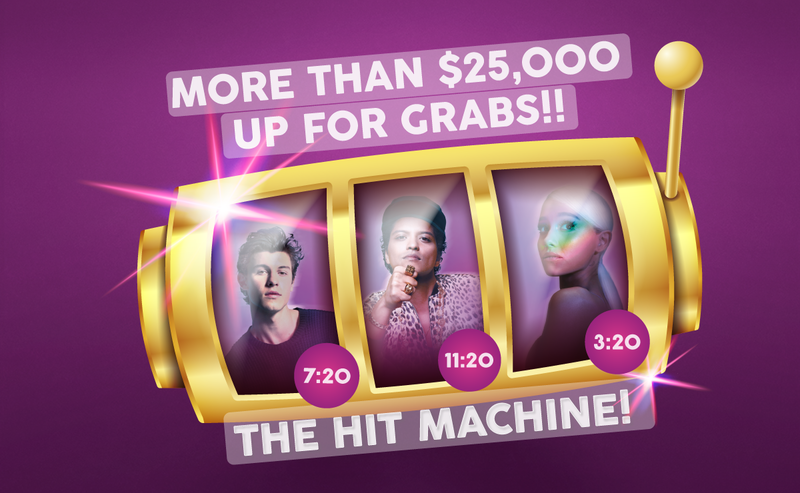 Every day, at 7:20am, 11:20am, and 3:20pm listeners will be given a HIT MACHINE KEYWORD. Then, listeners will have to TEXT that keyword to 92925. The announcers will randomly chose a number, and call a listener. Each contestant will have a choice between (1) A 5 second clip of a song (2) A 3 second clip of a song (3) A 1 second clip of a song. Based on the clip they will have to guess the song name AND artist. If they pick the 5 second clip, they can win $100, if they pick the 3 second clip they can win $250, if they pick the 1 second clip, they can win $500! Listeners will have 1 chance to pick a clip and guess the name and artitst. The Contest entry period commences at 7:20 AM Eastern Time (“ET”) on April 15th, 2019 and concludes at 3:20 PM ET on April 21st, subject to subsection 5.5 of the Contest Rules (the “Contest Period”). 2.1. The Contest is open to residents of Canada, who are eighteen (18) years of age or older. CKBE-FM radio station (“The Beat”) and Cogeco Media Acquisitions Inc. (“Cogeco”) (collectively, the “Contest Sponsors”), their affiliates, as defined in the Canada Business Corporations Act (the “Affiliates”) and respective employees, directors, officers, agents, successors, assignees, advertising and promotional agencies, involved or not in the Contest, as well as family and household members of any of the foregoing are not eligible to enter the Contest or win a Prize (as defined in subsection 5.4 of the Contest Rules). For the purpose of these Contest Rules, “family” means spouses, children, parents, grandparents, siblings (including step relatives) and their respective spouses, and/or persons with whom they are domiciled. Participant must meet the eligibility requirements as outlined in the Contest Rules throughout the entire Contest Period. 2.2. The Beat listeners who have won a prize from the Contest Sponsors with a value between one hundred and one thousand Canadian dollars ($100-$1500 CDN dollars)within a period of three (3) months prior to the beginning of the Contest Period are not eligible to participate in the Contest. The Beat listeners who have won a prize from the Contest Sponsors with a value equal to or more than one thousand five hundred Canadian dollars ($1500+CDN dollars) within a period of twenty-four (24) months prior to the beginning of the Contest Period are not eligible to participate in the Contest. At selected times during the Contest Period; listeners will be given a HIT MACHINE KEYWORD of the day. Then, listeners will have to TEXT that keyword to 92925. The announcers will randomly chose a number, and call a listener. Each contestant will have a choice between (1) A 5 second clip of a song (2) A 3 second clip of a song (3) A 1 second clip of a song. Based on the clip they will have to guess the song name AND artist. If they pick the 5 second clip, they can win $100 (CAD), if they pick the 3 second clip they can win $250 (CAD), if they pick the 1 second clip, they can win $500 (CAD). Listeners will have one chance to hear the clip and guess the song. The listener will have 5 seconds to guess the song name and artist. 4.4. Text within the allotted time. 4.5. Answer the phone when the announcers call. 4.6. For the purpose of the Contest Rules, “Contestant” means each Contest participant that meet the three (3) criteria’s mentioned in subsection 3.2 above. 5.1. One (1) Contestant will be randomly selected to participate in each contest attempt scheduled by the Contest Sponsors throughout the entire Contest Period (the “Contest Attempt”). 5.2. If any randomly selected texter or caller does not meet the eligibility requirements, he or she will be disqualified. Contest Administrator will then select an alternate Contestant by randomly selecting the next texter until an eligible Contestant is identified. 5.3. Decisions of the Contest Administrator in determining the correct text and selected Contestant for each Contest Attempt are final and binding in all matters relating to this Contest. Contest Sponsors are not responsible for telephone service outages, delays, busy signals, equipment malfunctions or any other technological difficulties that may prevent a participant from completing his or her text message, entering or participating in the Contest. 5.4. Contestants may win in the Contest a maximum of one (1) time during the entire Contest Period. Any Contestant must be the participant who originally texted the phone to participate in the Contest. The text may not be transferred to any other individual at any time during the contest. No family members, friends, office associates, or any other person will be allowed to participate in the Contest on another person’s behalf. The Contestant must provide his or her own name and birth date. If a Contestant uses a false name or birth date, he will be immediately disqualified from the Contest and be ineligible to win any Prize. his or her name, complete address, phone number and mother’s maiden name. All Contest entry information must be complete and accurate. The Contest Administrator will not award a Prize to any Contestant not meeting all eligibility requirements at the time of the Contest entry. Following the random selection of each Contestant and prior to attempting the Contest, the Contest Administrator will require the Contestant to identify his or her complete name, address, and phone number and confirm that the Contestant is in possession of a valid driver’s license or government picture ID card, valid health card, valid birth certificate, and mother’s maiden name. After confirming the Contestant eligibility, the Contest Administrator will then e-mail the contestant, confirm their information, request a check with accounting, and once the check is ready, will call the winner to retrieve their sealed prize. 5.6. Contest Sponsors and all related parties are not responsible for any incorrect or mistaken announcement of any portion of the ‘The Hit Machine’ printed on the certificate contained in the sealed envelope, or any miscommunication between a Contestant and the Contest Administrator regarding contestant information or the amount awarded. In order to claim the Grand Prize, the eligible Contestant’s name must match perfectly the printed on the certificate contained in the sealed envelope designated for that particular Contest Attempt, regardless of the actual date announced or any communication between the Contestant and the Contest Administrator. All Contest Attempts will be recorded in their entirety by the Contest Administrator. 5.7. Subject to what is provided in the Contest Rules, the decisions of the Contest Sponsors are final, and the Prize must be accepted as awarded. 6.1. Prize (The Hit Machine): In the event that a Contestant exactly matches the information in which the Contest Administrator has announced on-air to that particular Contest Attempt, then said Contestant will be eligible to claim the Prize, subject to approval and verification of compliance with the Contest Rules. The Prize for each round (3 rounds per day) is: Five Hundred Dollars OR Two Hundred and Fifty Dollars OR One Hundred Dollars ($500 OR $250 CDN OR $100 CDN), paid in the form of a check. In the event of a Prize Winner, the Contestant will be required to provide sufficient personal identification to the Contest Sponsors, whose offices are located at 800 de la Gauchetière Street West, Suite 1100, Montreal, Quebec. Such provision of personal identification includes the Contestant’s valid driver’s license or government issued identification, valid health card and original birth certificate (as outlined in subsection 4.5 of the Contest Rules). Failure to provide the required documents and information within the required time limit will result in forfeiture of the Prize. The deadline to claim the prize is three (3) months from the date they won the contest. 8.1. Present his or her valid driver’s license or valid government issued photo identification, valid health card, and original birth certificate to the Contest Sponsors.The information on the identification documents must match exactly the information provided by the Contestant during the Contest text message and e-mail. Subject to what is otherwise provided for herein, the decision of the Contest Sponsors is final. Prize must be accepted as awarded. No portion of the Prize is transferable. Prize is not redeemable for cash and no substitute for any portion of a Prize is offered. Should a Prize Winner be unable to claim a Prize as awarded, his or her entry will be forfeited. Prize portions are non-exchangeable, non-transferable, non-refundable, have no cash surrender value and must be accepted as awarded with no substitutions. The Contest Sponsors reserve the right, in their sole discretion, to substitute and/or modify a Prize, or Prize portion, with a prize of equal or greater value for any reason. Should a Prize Winner be unable to claim his or her Prize or Prize portion as awarded, his/her rights to claim such Prize or Prize portion will be forfeited. Prize Winners are responsible for all costs associated with their Prize (the “Expenses”). Each Prize Winner understands that he or she may not seek from the Releases reimbursement for his or her Expenses. The Contest Sponsors make no representation or offers, nor do they provide any warranty, express or implied, as to the quality or fitness of the Prize. Prize Winners understand and acknowledge that they may not seek reimbursement or pursue any legal or equitable remedy from the Releasees should a Prize fail to be fit for its purpose or is in any way unsatisfactory to the Prize Winner. Subject to applicable law, the Contest Sponsors reserve the right to cancel, suspend, terminate, modify the Contest Rules or administration of the Contest, in whole or in part, without prior notice with no obligation or liability, including, if for any reason, the Contest is not capable of running as planned, whether due to technical failure, tampering, fraud, corruption of security or other causes beyond the control of the Contest Sponsors, subject to the approval of La Régie des alcools, des courses et des jeux du Québec, as needed. All entries shall become the property of the Contest Sponsors and their advertising and promotional agencies. The Releases assume no responsibility for lost, stolen, destroyed or otherwise indecipherable entries due to any failure or technical malfunction of the telephone network, on-line computer systems of equipment, servers, access providers, software, poor reception, technical problems, failure of any email or submission or due to any other reason regardless of cause. By participating in the Contest, each participant, including each Prize Winner consent to the use of his or her name, city of residence, photograph, voice, likeness, image or any other aspect of his or her personality for any publicity and programming purposes, commercial or otherwise, in all media used by the Contest Sponsors, promoters and their advertising and promotional agencies, without any payment or compensation. Each Prize Winner further agrees that his or her audio reaction may be used for on-air promotional purposes. The participants understand and acknowledge that the Contest Sponsors may contact him or her on-air without prior knowledge as a result of his or her participation in the Contest. By entering the Contest and voluntarily providing personal information including, but not limited to, name, address, city, email address, home and office telephone numbers (the “Registrant Information”), each Contestant grants permission to the Contest Sponsors to collect and use the Registrant Information for the exclusive purpose of administering the Contest and selecting the Prize Winner. No correspondence will take place between the Contest Sponsors and the participants except in connection with the Contest and, in the case of a Prize Winner, as a result of entering the Contest and winning a Prize. If for any reason the Contest is not capable of running as planned, including due to infection by computer virus, bugs, tampering, unauthorized intervention, fraud, technical failures, or any other cause beyond the reasonable control of the Contest Sponsors that corrupts, impairs or affects the administration, security, fairness, integrity, or proper conduct of this Contest, the Contest Sponsors reserve the right, at their sole discretion, to cancel, terminate, modify, extend or suspend the Contest and/or Prize, subject to the approval of La Régie des alcools, des courses et des jeux du Québec, as needed. The Contest Sponsors further reserve the right to disqualify, from the Contest and future contests of the Contest Sponsors, any individual who tampers with or in any way corrupts the entry process. The Contest Sponsors may prohibit a participant from participating in the Contest or winning a Prize if, the Contest Sponsors, in their sole discretion, determine that said participant is attempting to undermine the legitimate operation of the Contest by cheating, hacking, deception, or any unfair playing practices (including the use of automated quick entry programs) or intending to annoy, abuse, threaten or harass any other participant or the Contest Sponsors representatives. Any attempt by an participant or any other individual to deliberately damage any web site or undermine the legitimate operation of the Contest may be in violation of criminal and civil laws and should such an attempt be made, the Contest Sponsors reserve the right to seek remedies and damages (including lawyers’ fees) from any such participant or any other individual to the fullest extent permitted by law, including criminal prosecution. By entering the Contest, the participant agrees that the Releasees shall have no liability and shall be held harmless by the participant for any damage, loss or liability to person or property, due in whole or in part, directly or indirectly, by reason of entering the Contest, the acceptance, possession, use, enjoyment or misuse of any Prize, or while preparing for, participating in any Contest-related or Prize-related activity. The Releasees are not responsible for technical, hardware, software or telephone failures of any kind, lost or unavailable network connections, fraud, incomplete, garbled or delayed computer transmissions, whether caused by any of the Releasees, users or by any of the equipment or programming associated with or utilized in the Contest or by any technical or human error which may occur in the processing of submissions that may cause damage to a user’s system or limit a potential participant’s ability to participate in the Contest. These Contest Rules are available in English online at www.thebeat925.ca and at the offices of The Beat, located at 800 de la Gauchetière Street West, Suite 1100, Montreal, Quebec during regular business hours. All participants agree to abide by the Contest Rules, which are subject to change at the sole discretion of the Contest Sponsors, subject to the approval of La Régie des alcools, des courses et des jeux du Québec, as needed. This Contest is void where prohibited by law and is subject to all applicable federal, provincial, territorial and municipal laws and regulations of Canada. Any litigation in respect the conduct and awarding of a Prize in this Contest may be submitted to La Régie des alcools, des courses et des jeux du Québec for a ruling. Any litigation respecting the awarding of a Prize may be submitted to La Régie des alcools, des courses et des jeux du Québec only for the purpose of helping the parties reach a settlement.